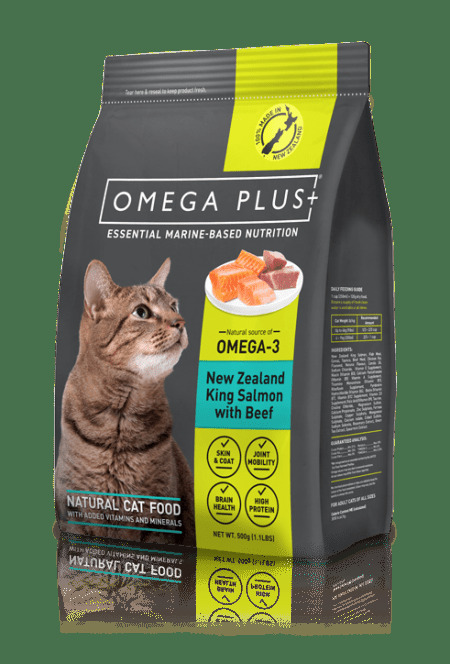 Omega Plus Cat King Salmon & Beef Dry Kibble 500g Omega Plus dry cat food is a complete and balanced formula that tastes great. High in protein and those important omega-3 s, your cat will get all the nutrients they need while enjoying the great taste of King salmon. Omega Plus dry cat is in a small kibble form and comes in a 500g bag. King Salmon, Fish Meal, Cereal, Tapioca, Beef Meal, Chicken Fat, Flaxseed, Natural Flavour , Canola Oil, Sodium Chloride, Vitamin E Supplement, Niacin (Vitamin B3), Calcium Pantothenate (Vitamin B5), Vitamin A Supplement, Thiamine Mononitrate (Vitamin B1), Riboflavin Supplement, Pyridoxine Hydrochloride (Vitamin B6), Vitamin B12 Supplement, Vitamin D3 Supplement, Folic Acid (Vitamin B9), Taurine, Choline Chloride, Magnesium Sulphate, Calcium Propionate, Zinc Sulfate, Ferrous Sulphate, Copper Sulphate, Manganese Sulphate, Calcium Iodate, Cobalt Sulfate, Sodium Selenite, Rosemary Extract, Green Tea Extract, Spearmint Extract. Guaranteed Analysis Crude Protein _ _ _ _ _. Min 30% Crude Fat _ _ _ _ _ _ _.. Min 15% Crude Fibre _ _ _ _ _ _.. Max 5% Moisture _ _ _ _ _ _ _ _. Max 10% *OMEGA-3 _ _ _ _ _ _ _ Min 2.5% *OMEGA-6 _ _ _ _ _ _ _ Min 2.75% *Not recognised as an essential nutrient by the AAFCO Cat Food Nutrient Profiles.